drawing pastels, & mixed media. I am a graphite artist specialising in Animal Portraits, from horses and dogs to lions and elephants. using a variety of mediums to create cartoon like images. Inspired by current affairs, news stories and magazines like Private Eye. is Brushstrokes based in Ashford. Portraits & landscapes. See website. I am a self-taught artist with a lifetime passion for drawing and painting. 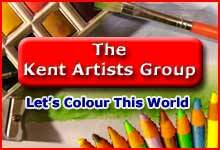 Please let Your friends know about the Kent Artists Group.